Subversion look at Solidarność's role in the uprisings which preceded the end of Stalinist rule in Poland. The 1980 workers’ uprising in Poland was not the first time the working class there had fought back against state capitalism. ln 1956, 1970 and 1976 workers had taken to the streets when the state had tried to impose cuts in their standard of living by raising food prices. The strength of the working class was such that, despite severe repression, in each case the state gave in. These uprisings underlined the fact that there was a line beyond which the state could not go at that time. They also meant that the state was forced to constantly rethink its strategies for increasing the competitiveness of Polish capital. The state’s solution to the 1970 revolt was to try to modernise the economy by importing western capital and technology. This was to be paid for by exploiting the peasantry in order to subsidise the money wages of the workers with cheap food After 1976 the idea of autonomy for enterprise management was introduced. This was to prove crucial in the early stages of 1980. Despite their best efforts, the Polish state built up a huge debt to western banks by 1980 – approximately $28 billion. It’s response was to try to cut the subsidies to workers and on June 30th announced a “reorganisation of meat distribution”, which meant a 60% increase in the price of meat. The working class responded with a wave of strikes effecting factories in Ursus (tractors), Huta Warzawa (steel), Poznan (metallurgy), Tczew (transmissions), Mielec (aviation) and Swidnica (aviation). The party’s response was to try to negotiate locally. They couldn’t risk losing the goodwill of the West, nor risk a major disruption of production which would endanger its ability to service the massive foreign debt. The policy of local enterprise autonomy made this policy easier to put into practice The hope was that it would keep workers divided. The result was the exact opposite. Workers in other plants saw their fellows winning demands and immediately went on strike themselves’ They took the opportunity to elect strike committees and organise themselves. By July 15th there were 50 strikes going on. 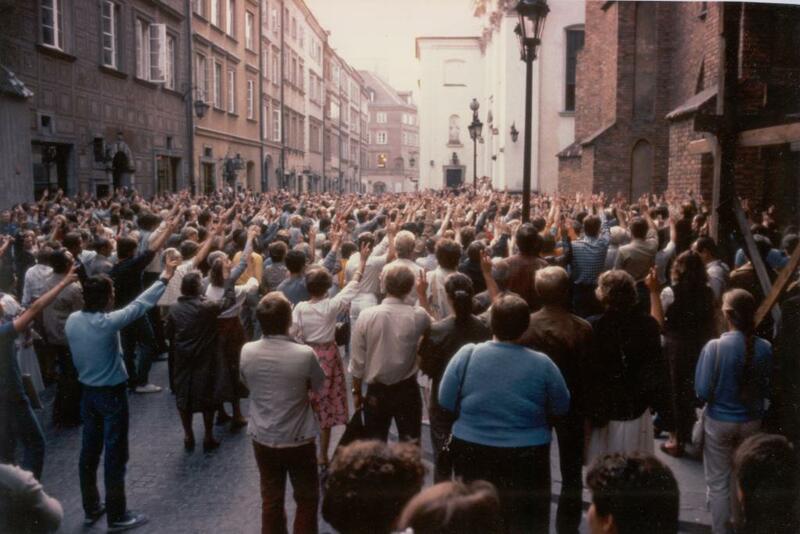 Two days later the city of Lublin, with a population of 300,000 started a general strike. Even at this stage there was a major change with previous uprisings. In earlier years workers had taken to the streets, this time they remained in their workplaces to avoid being gunned down. They remained where they were strong and united. The strike wave continued until early August. At this point the state decided on a new approach. If the carrot had failed, now they would go back to trying the stick. The problem they faced was in finding who to repress. These strikes were examples of workers organising themselves. There were no obvious leaders who had instigated it, nor easy targets to pick on. There were underground groups and “free trade unionists”, but they had not played a central role in the struggle up to this point. Failing anyone else to repress, the state turned on these people. Repression started on August 11th when a bin man was arrested for 9 hours. Two days later, 3 Lenin Shipyard workers connected with underground unions were arrested. Up to this point, Gdansk, Sopot and Gdnyia (the centres of the shipbuilding industry) had been mostly quiet. The result was a general strike that spread rapidly from shipyard to city. A strike committee of 10 was elected (including Lech Walesa who had climbed over the wall when the strike broke out) which was soon joined by 100 delegates from other departments. They published a list of demands, some of which were economic, some political. By 18th August 100 enterprises in a 100km area around Gdansk were on strike. An inter factory strike committee (the MKS) was set up with two delegates from each factory on strike. The MKS controlled the entire region and resolved all problems of food and transportation. MKS were set up in Szczecin and the Silesian mines. The strike wave had spread all over Poland, accompanied by self-organisation of the working class that was challenging the authority of the state in a way that had never happened before in Poland or most of Europe. But it also contained the seeds of its own destruction. Soon the strike wave was to be hijacked by those with quite specific objectives that turned out to be against those of the workers. Lech Walesa was one of the signatories of this charter. Supporters of KOR had a lot of respect in Poland. They endured state repression and carried on their work. There is no denying that they were brave men and women. It is right to deny that their objectives coincided with the needs of the working class. They had little role in the early days of the uprising. Ironically it was the state which turned them into its leaders. Looking for someone to pick on, it was supporters of KOR that they found. This reinforced the idea that they were the state’s strongest opponents, so workers looking for new ideas increasingly turned to them for leadership. Thus it was that Walesa got elected to the strike committee at Gdansk. even though he did not work in the shipyard he represented. Other oppositionists became members of the MKS Praesidium on the basis of their being experienced negotiators. The original demands of the Gdansk strikers were as political as they were economic. They contained all sorts of mystifications about democracy, free elections and judicial independence, but nonetheless their central thrust was simple – to get rid of the Communist regime in Poland. This terrified the oppositionists. Bogdan Borusewicz, a leader of KOR in Gdansk said “Asking for pluralist electionss is maximalism. If the Parry gave in, Moscow would intervene. There must be no demands which either force the government to resort to violence or lead to its collapse. It was the ending of censorship that led to intervention in Prague. We must leave them some exits.” By the time the demands had been finalised, the KOR had got their way. The state would be allowed a way out. Work resumed. The MKS at Gdnask and Szcezin formed themselves into branches of Solidarnosc. By the end of the month it represented 90% of the workers in Poland. What was really amazing was just how quickly Solidarnosc began to act like established trade unions in the West. Its leaders quickly get themselves into positions of being intermediaries between the workers and the state. In the guise of “representing” the working class they went around stopping strikes, toning down wage and other demands in the interests of “national unity”. As early as September 16th, Solidarnosc in Gdansk warned against wildcat strikes – even though it was these same strikes that had started the uprising just two months before! and called the strike off, without consulting anyone. A pattern was beginning to emerge. Faced with pressure from the working class, Solidarnosc called for token strikes, did deals and called off strikes. A common spectacle was Walesa flying round the country in a government helicopter telling workers to go back to work. However, the strikes continued. October and November 1981 saw the beginning of street demonstrations which the union could not control. By the middle of November there were more than 400,000 wildcat strikers in Poland. After its September and October Congress, Solidarnosc started to make political demands of the state. It wanted to move towards Poland becoming a western style democracy, so it could operate as a western style trade union. Having lost much of their political control over their members, Solidarnosc’s leaders hoped that such reforms would enable them to regain it. The state could not permit such a challenge to its authority. Solidarnosc was useful when it could control the working class. Faced with a working class outside its control the state called upon the Polish military to take over and reestablish order. In 1980 the military, faced with a united and confident working class, and trusting in the Party’s ability to rule, had been unwilling and unable to do this. Fourteen month’s of Solidarnosc’s malign influence had undermined the unity of the working class, at the same time as the Party had lost its legitimacy and ability to govern. The army took over in the first military coup in a state capitalist country. Workers fought back but were put down ruthlessly by the army. Many were given long prison sentences, others killed. Walesa was put into “preventative custody”. Clearly he was not someone who should he dealt with too harshly. Maybe they saw him as a person they would need to deal with in the future. It is too easy to look at the Polish uprising as being a simple case of good workers against bad bureaucrats. We have tried to show that the aims and activities of Walesa, the Solidarnosc bureaucracy and the KOR were against the interests of the working class. They were able to substitute their own agenda for that of the working class. What we have not tried to show is that the working class were champing at the bit for revolution in 1980 and only held back by the bureaucrats. Such a view, favoured by many, pays no regard to reality. The uprising was a result of the self-organisation of the working class. It wasn’t the result of any planning by underground bodies. The initial objectives of the working class were economic, but we have seen how many workers had political objectives which included getting rid of the Stalinist state. However, most workers saw Solidarnosc as being their own creation. Even after a year of backstabbing, Solidamosc had a membership comprising 90% of the Polish working class. There was a very real tension between the centre and the branches, with rank and file members pushing demands forward, fighting for them and then the centre acting to diffuse the situation. Within the branches there was still a healthy tendency to struggle which had not at this stage succumbed to the ideology of trade unionism. It was the failure of the bureaucrats to gain control of the branches that led the army to seize control in the end. It is hardly surprising that for many workers Solidarnosc was a creation they supported. For years they had been fighting against the Polish state. Each time they rose up their gains were snatched back. They were looking for something that would guarantee their gains. Because they knew no different, they believed that free unions were the answer. What they had in mind was the kind of idealised conception of unions that keeps workers supporting them throughout the world. If workers here, who have years of experience of sell-outs still support the unions, is it surprising that Polish workers should see them as an advance? Further, Polish workers knew that they were on their own. There were no similar actions in other parts of the Soviet bloc, and especially no similar activity in the USSR itself. They knew that if they pushed too far the result could only be Soviet intervention and massacre. This situation was made worse by a strong nationalist tendency which saw the situation as being a purely “Polish” one. Active revolutionaries would have tried to spread the struggle as internationally as possible. Any attempt by workers to set up permanent organisations to negotiate with the state and employers will eventually go the same way as Solidarnosc. Trying to fulfil that role immediately raises questions of reaching compromises, doing deals, seeing the other side’s point of view. For workers that means accepting speed ups, productivity deals, lower living standards, job cuts and so on. It means accepting the boss’s right· to own and control the means of production. The logic of class struggle is the opposite of this. It questions the right of the boss to manage and ultimately brings into question who controls society. It is clear to us that the only way forward for our class is to get rid of the whole buying and selling system and the state and bosses who go with it. Despite the failure of the workers in Poland, despite their setting up of Solidarnosc, their uprising shows us many positive things. It shows us that even in the most unlikely of situations, up against ruthless enemies, the working class is capable of fighting hard and taking on the enemy. The way they organised themselves, in their strike committees and the ways their delegates reported their deliberations were an example for others. It shows the limits of struggles within national borders and the need to spread the struggle internationally. When our class is united and the struggle is international, there is nothing that can not be accomplished. Some more reflections: One of the major drawbacks to Solidarity was the fact that it quickly established a few leadership cliques which exerted their influence over the union. What lacks in this article, and in fact in many studies on Solidarity published outside Poland, is an analysis of the internal structure of the organization. What we clearly see is that it was far less than democratic, although many works published in the West tend to label it so. There were of course different factions in the leadership. Most tended to want to control and deradicalize the workers. The workers themselves were never able to organize themselves effective without the leadership, which eventually undermined the whole thing. The long-term goals of different leadership factions also were contradictory, which is evident in both their postulates and publications. There has been debate in the left (albeit too little) about whether or not they were arguing for the restitution of capitalist. According to the postulates, they were - although there were often strong social democratic elements and a touch of "workers' control". We see from the experience of Eastern Europe that in some countries this initially meant debureaucratization of the industries, then meant self-management in conditions more in tune with the market, then meant the integration into the market... etc. etc. Thanks for those comments akai. Interesting, would you be able to post that to the library/history?